Joseph (Peter Mullan) is angry at life and is on a downward spiral of self-destruction. He takes his violent rage out on anyone who crosses his path - even if that person (or animal) has done him no wrong whatsoever. A chance connection with christian charity shop worker, Hannah (Olivia Colman), offers him the possibility of redemption as the two form an unlikely friendship based on a mutual need for understanding and forgiveness. Tyrannosaur is not a film for the faint hearted. I found it an extremely tough watch. There are brutal scenes of violence (against people and dogs), disturbing sexual violence, a lot of strong language and the overall atmosphere of the film is pretty bleak. It left me wondering why anyone would set out to make such a film. And I am not sure that I have an answer to this question. Films are not always there for pure entertainment. Some movies have a point to make and seek to reflect key issues in our society. 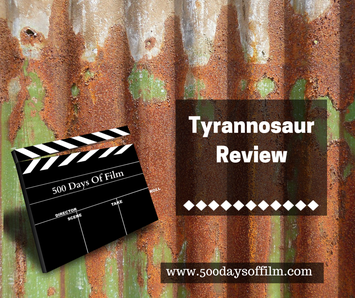 Tyrannosaur lifts the lid on the rage and frustration that can build in a man devoid of hope and of love. It also encourages us to think about how we view others. Things may not be what they seem. On the face of it, Joseph is an extremely hard character to like. However, his friendship with Hannah makes us see how things could, perhaps, be different for him in the future. The film is brilliantly directed by Paddy Considine and featured truly amazing performances. Peter Mullan is superb as Joseph. He is full of barely repressed fury and a violent outburst never seems far away. However, as we get to know him we see that he cannot be dismissed as a ‘thug’ and that he has complex layers of remorse, regret and he does want a chance for a better life. Meanwhile, Olivia Colman is stunning as Hannah. Her performance is so powerful and moving - she handles the more shocking scenes of the film brilliantly. I liked the way that Tyrannosaur stayed true to itself until the end. Yes we see that Hannah’s influence on Joseph is changing him and enabling him to control his anger. However, this does not always mean that he will be rewarded for doing so. Tyrannosaur reflects the fact that, in reality, life is much more complicated. Tyrannosaur is not an enjoyable film to watch. However, it is a film with something important to say and is not afraid to challenge us and force us to look at some of society’s most challenging issues. It doesn’t offer us any message or solution - it just reflects something that most of us would rather not see. As a result, and because of the superb central performances, I would recommend this film. It is a testament to the way Joseph has been written and portrayed that, following the violence he inflicts on his dog, I cared for him at the end. Eddie Marsan is also fantastic in this film.